The Fellowship was fortunate enough to obtain a copy of THE SHADOW #1 from Dynamite Comics. Garth Ennis writes, Aaron Campbell draws, Carlos Lopez colors, and Rob Steen letters. It’s 1938, and the world is on the brink of war. The Empire of Japan has done some bad things, but the worst is yet to come—unless it can be stopped. But only one man knows how to do that: The Shadow! This issue marks the beginning of a new era with Garth Ennis at the helm, and he starts right out of the gate with intrigue and espionage abounding. This first issue sets up two things—the enemy, specifically a Japanese intelligence officer, and the character of Cranston/The Shadow. And Mr. Ennis does both in a way that gives the reader good reason to dislike both; he gives us a glimpse into the horror that was the Empire, and he shows us enough of Cranston’s personality that we begin to wonder how ‘good’ a person Lamont really is. Given the rise of the anti-hero in our culture, though, this gives the book potential. This looks like a solid beginning to the series, and the story really could go anywhere from here. Let’s see where the award-winning Mr. Ennis takes it, eh? 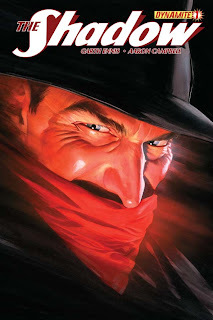 THE SHADOW #1 is available now at your FLCS or by order from dynamite.net.